In the last post I talked about how the caprail and rubstrake would fit together differently than the original design (see here). I had planned on nesting the rubstrake underneath the caprail and screw it in from the top. Joel (A35 #52 out in Washington state) had originally turned me on to the idea and I thought it was a better solution than the original layout. 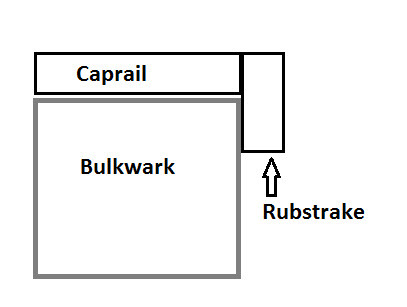 Well, as it turns out, I will be installing the caprail using the same design as the original despite my plan. The problem I ran into was that I just didn't have enough width on the top board to allow for the rubstrake to be nested underneath and screwed from the top. I cut the top board slightly too narrow and my plan for a 5/8" width rubstrake just wasn't going to work. I think I may have been able to pull it off, but I only had enough width for a 3/16" rubstrake and that would have been pretty tough to screw into. 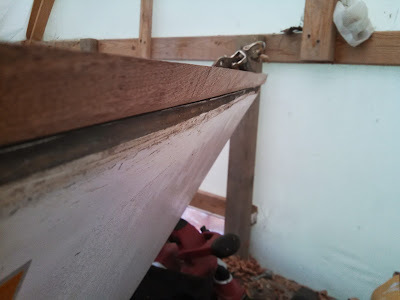 I knew that this was a possibility as soon as I cut the top boards for the caprail, but it wasn't until I had everything in place that I was able to come to terms with it. Oh well, not the best solution, but since the original had lasted 45 years, I can make it work again. Unfortunately, this change necessitates a lot of planing along the outboard edge of the caprail at a continuously changing angle so it is slow going. I setup some staging so I could work at eye level and take most of the excess wood off with a power planer and then finish it up with a jack followed by a block plane. I'm sure OSHA would have a field day with my rickety setup, but I haven't fallen yet. 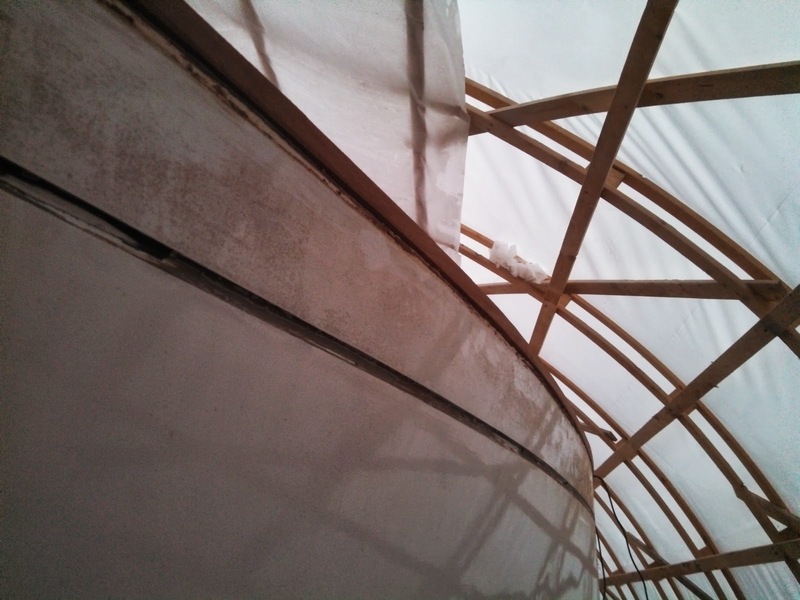 After about 1.5 hours of work I've finished up about half of the port side and the first 4 feet or so of the starboard bow where the angle is the greatest. With any luck (and some minor familial neglect), I can have both sides prepped and ready for the rubstrake by weeks end. Hey Matt, are you painting/refinishing the topsides? I've been planning to fair, seal and then paint Renaissance before i install the new caprail... thoughts?